In the course of the Ionian Singers year, there is a cycle of rehearsals leading up to a performance. After a particularly good rehearsal last night, it occurred to me that there are various flavours of rehearsal that we enjoy or endure, but we don’t have names for them. In each concert there are contemporary challenges that really take a lot of effort to learn. I shall call these rehearsals ‘The Sloggers’. There is sometimes the moment when I feel that we are never going to master this and is it really worth it? But for all my many years with the choir I have learned to trust the conductor that we will be rewarded by the music eventually. After many ‘Sloggers’ there comes ‘The Turner’ or perhaps ‘The Critical Point’ when it suddenly starts to come together. That happened last night and it was really wonderful. The harmonies started to coalesce, our soprano soloist, always reliable, was on topmost form. And then, the concert night approaches and I can cal these ‘The Polishers’, finishing with ‘The Top and Tailer’ where, at the end of one piece we really get to feel precisely what the first note of the next piece will be. Last time I wrote in this blog I told of the excitement of that first night of rehearsals for the next concert. So many good sight-readers, that there was instant music. At first I was a bit disappointed with the programme because I had performed it all before. However, as things turned out the concert was a really memorable occasion. Of course there were some new choir members learning our ways, and learning a lot of new music too. We encountered a tuning problem along the way. Let’s be honest, it happens to every choir, even those who perform with accompaniment. The reasons are manifold, but often it is a matter of everybody being able to hear the other parts. For that you need to be able to sing softly and be in a suitable acoustic. As for the acoustic, we have changed our rehearsal venue after 25 years and although much improved, it takes a little getting used to. (It’s warm too which is a great novelty!) Well, the Ionian Singers can sing more softly than any choir, but even so, our wise conductor has a solution. We call it ‘Singing in cells’. Cells without bars of course, but the principle is that nobody is singing next to anybody singing the same part. Hey presto! Instant perfect tuning! But there are problems associated with this. The tuning may be perfect but the ensemble is more difficult to maintain. Singing on your own, there is no support from another similar voice (who may be a really good reader). But, as the rehearsals rolled by, the individual confidence just grew and grew and grew. And for me, I suddenly got to hear some of the wonderful lines that other parts got to sing, so much so that iIn Elgar’s ‘The Fountain’ I was frequently distracted waiting to hear a really great line from the tenors. OK, I had sung most of the repertoire before, but now I found that I really didn’t need the music very much. The occasional glance was enough. Our conductor is totally consistent so we know when to give maximum attention to changes of tempo and other critical points. It is just so great to feel totally in command. In our usual way, we shared our concert with a solist. This time it was Emily Gray, a mezzo soprano. She was a breath of fresh air. So bouncy and alive and a real star performer. She really knew how to work her audience and lighten the whole evening. Our conductor provided the piano accompaniment. Being accompanied like that must give a performer a great sense of security. All in all, a memorable concert. Thanks to a great audience and thanks to all the team who helped with the many administrative tasks. I’m feeling happy this week. It could be because the summer seems finally to have arrived. It could be because my job is going well. But actually I think the real reason is that the Ionian Singers have started to rehearse for their next concert. I’ve really missed singing over the last few weeks. What’s particularly exciting is that we are preparing for two concerts at once: at the Danish Church on 23rd June and at St Peter’s Church, Eaton Square, on 7th July. Two concerts means twice as much music to work on, which in turn means twice the fun. Our regular audiences will know that all our concerts are unusual, but these two are even more unusual than most. The programme for the Danish Church is shorter than usual, because the concert is followed by an outdoor party to celebrate St John’s Eve. It is appropriate, then, that we will sing a number of folk-songs, both Danish and English, arranged by our own Timothy Salter. Somehow madrigals and summer go together, so we’ll do some of those too. 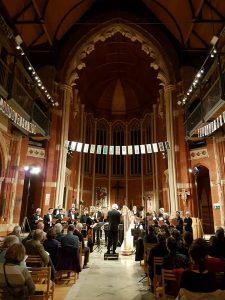 Add a few part-songs by Coleridge-Taylor, Elgar, Finzi, Ireland and Stanford, and there is surely something for everyone. What is unusual about the programme for St Peter’s Church is that we will have the services of the organist Julian Collings. This means that we can perform anthems by Bainton, Ireland, Stanford and Wesley, which require organ accompaniment. And two gems from Purcell, one of my heroes. Just in case we are afraid of wallowing in these lovely works, there are challenging pieces from Jonathan Harvey, William Matthias, Timothy Salter and Peter Warlock. I am so looking forward to rehearsals. Today we had our ‘Come and Sing’ event. Arrived early at the church and heaved 50 chairs up to the chancel. That just left the minor tasks of shifting: the altar, the piano, another piano, lectern, etc etc. To get 50 seats in was quite a squash. It was great to meet so many interesting people. As the first piece of music Timothy Salter chose ‘If ye love me’ by Thomas Tallis. All those extra voices made a wonderful sound – a very encouraging beginning. There were about 20 of the Ionian Singers there among the 50 singers and they were scattered around amongst the visitors. The intention was that there would be plenty who knew the notes. BUT when Tim asked who were sight-reading, most of the hands went up, including the Ionians! The flyer had suggested that reasonable sight reading was an advantage but the standard sounded really good to me. It was immediately apparent that Timothy Salter’s conducting style is precise, clear and very consistent. Tim introduced one of his folk song arrangements which was very well received. At least the people either side of me were quite delighted. We did a couple more later on, including ‘Blow the Wind Southerly’. I have sung this deceptively simple piece several hundred times and it STILL gives me goosebumps. The church was not the warmest of places, so teatime was very welcome. Most people were hugging their mugs like hot water bottles. We rehearsed a great range of music, from Brahms part songs to Elgar and Rubbra. When it came to Stanford’s Bluebird, the sopranos really showed that they are right up to standard. It was a great day and I hope that we see a lot of the new faces again at future workshops. Take 45 enthusiastic singers, 15 pieces of music for unaccompanied choir, 1 charismatic composer/conductor and plentiful supplies of tea and cake, and what do you get? The answer is, of course, the Ionian Singers’ first ‘Come and Sing’ session. The idea was to invite singers to come along, find out what happens at one of our rehearsals, and get a taste of the sort of music we sing. If you’ve been to any of our concerts you’ll know that our speciality is singing less well-known or unjustly-neglected music. Ranging from church music by Byrd and Tallis, through sacred and secular songs by Brahms and part-songs by Elgar and Stanford (yes, of course we sang The Bluebird) to later twentieth century music by Rubbra and Skempton – and what Ionian event would be complete without a few of Salter’s folksong arrangements (and yes, of course we sang Blow the wind southerly) – both regular choir members and visitors had the chance to enjoy making music together, and to see how, under Timothy Salter’s direction, a rough approximation could be turned into a real performance. From the first few notes I was aware that the sound today was different. A choir twice the size of our usual line-up is quite a different beast, and has its own advantages and problems. While singers may feel slightly less individual responsibility for their own line, and an individual missed entry may be less disastrous, having a larger choir brings its own problems of ensemble, especially when both the repertoire and the singers beside you are unfamiliar. However, it was surprising how quickly the singers from varying backgrounds and choirs blended with each other to produce a unified sound. What better way to characterise the event, and the pleasure of singing with The Ionian Singers, than to borrow the last words of Stanford’s Angler’s Song: ‘Other joys/Are but toys/And to be lamented’. Question: What do you get if you bring together a choir, a conductor/composer, a church with a wonderful acoustic, and a brilliant recording engineer? Answer: A recording of some fantastic music. Eventually. Eventually was very much the operative word as we stood round in St Silas’s church. Located in Camden, the church proved to be a remarkable building; a little slice of Anglicanism where the Reformation appeared as an inconvenient and readily-ignorable footnote in British history. But no amount of thrones or statues could make up for the temperature. The radiators put in a valiant effort, but oh it was cold! And soon the realisation had dawned on us that we would be stuck there. All day. The rest of the morning was spent on the remaining four movements of Invida Aetas, none of them, fortunately, quite as difficult as the first. Eventually we were belting out carpe diem, singing lovingly of the garden and stream that we wished for, and being tossed with our ship on the turbulent seas, making for a safe harbour. ‘Maybe a few more than 85 takes’, some of the sopranos predicted, as we closed the morning having recorded several snippets again and again and again. This was not, it should be pointed out, all due to the singers. While St Silas’s has a lovely acoustic, it is not entirely soundproof. Throughout the day we were competing with the occasional plane, siren and lorry, all of which seemed keen to join in and make our music even more avant-garde than it already was. Not to mention the eager washing machine, whose spin cycle disrupted us more than once. At least, it sounded like a washing machine, although none of us was entirely sure why there was a washing machine in the church. Possibly it was just the sound of God moving in very mysterious ways. The afternoon was given over to recording some of Tim’s folksong arrangements. As a result, on a cold winter’s day, we found ourselves singing about springtime cuckoos. The Ionians are nothing if not perverse. Wrapped in our coats and scarves, and in many cases trying desperately not to cough and sneeze, we got through The Cuckoo is a Pretty Bird and Fair are the Flowers in the Valley (the latter incorporating homages to Mahler and Beethoven, among others). ‘Maybe 95 takes?’ the sopranos predicted. ‘One hundred and twenty?’ (By this stage we were running a highly unofficial sweepstake). By the time we completed our folksong session, which included our best saucy piratical rendition of Tim’s The Coasts of High Barbary (in which the only musical direction at the beginning of the piece is ‘nautically’), the number of takes had crept up to just under one hundred. A long and tiring day, but we’d made it! Exhausted as we were, there was only one thing we could do. Nicola, one of our sopranos, lived nearby and was luring us to her house with an offer of wine. Nunc was definitely the time to bibendum. By late November, many other choirs are so satiated with carols or other seasonal favourites that they start to feel decidedly post-Christmas-dinner-ish. But we are not other choirs, and so our concert in All Saints West Dulwich on November 25th was markedly different. Not that we failed to give a passing nod to the season. Our opening number was I Sing of a Maiden by local Streatham boy Arnold Bax (1883-1953), a setting of a fifteenth century hymn to the Virgin Mary that deserves to be better known. After that, however, we tore up the Christmas rulebook and went for two distinctly non-seasonal pieces by Elgar. The first, Love’s Tempest, displayed a passion that might have horrified many buttoned-up Edwardians, love being described as a ‘tumult wilder than a storm at sea’. Then again, the words were originally written by a Russian (Apollon Maikov), so perhaps he could be excused for not hiding raw emotion under a stiff upper lip. And the second of the two songs, Go Song of Mine, spoke of a song to ‘break the hardness of the heart of man’, suggesting that music might have the capacity to chip away at British reserve, even if it all ended up very properly with meeting the ‘Maker at his heavenly shrine’. Next up were two beautifully melodic songs by Debussy, originally written for solo voice but transcribed by our director, Timothy Salter, for the wonderful combination of chorus and harp. For this we were joined by the award-winning young harpist Oliver Wass, who provided the perfect accompaniment. Beau Soir started off as a song in praise of a beauteous evening, and finished with the cheerful reminder that we’re all going to our graves (thanks for that, Debussy), while Nuit d’Etoiles was a love song, albeit one reminiscing about love that had long been lost. For these we had worked hard on our French pronunciation, and managed to remember that champs de blé does not rhyme with ‘Theresa May’. The remainder of the first half of the programme was taken up by instrumental music. Here Oliver Wass was joined by the brilliant young violist Luba Tunnicliffe, whose playing entranced the audience and provided ample proof that harp and viola are a winning combination. Very little original music for harp and viola exists, but fortunately our own Timothy Salter had stepped into the breach with a transcription of Elgar’s captivating piano piece In Smyrna. This was followed by a couple of movements from the Fantasy Sonata, an original harp/viola piece by Bax. 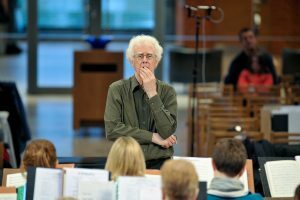 The critic Stephen Moss once described Bax’s works as being “the promotional kiss of death”; given that we had two Bax pieces in one concert, we might be said to have embraced death with open arms. Although as Debussy pointed out, that’s where we’re all headed anyway. And the audience certainly seemed to enjoy both I Sing of a Maiden and the Fantasy Sonata, with its lilting Irish-inspired melodies. We opened the second half with Barber’s gorgeous Twelfth Night, a setting of poem by Laurie Lee. Then from the sublime to the downright dissolute, we moved to a setting by the US composer Argento of some doggerel verse by Keats. In Praise of Apollo, a paean to the joys of wine, started off with all four parts in unison, but by the end had descended into a raucous counterpoint that recalled the best sort of nights down the pub. Next up were more pieces for viola and harp, first Salter’s transcription of Rachmaninov’s Prelude Op.32 No.5, then a lvoely arrangement of some of Prokoviev’s Romeo and Juliet Suite transcribed by Oliver Wass. This was followed by two more of Salter’s transcriptions, of Debussy’s Pour Invoquer Pan, and the Prélude from the Suite Bergamasque, after which the chorus joined the instrumentalists for Salter’s otherworldly Nocturne, originally written for harp and chorus but here rewritten to include viola too. At the end of the evening one of the audience members was heard remarking what a wonderfully diverse and unusual programme it was. And that, of course, is what makes us the choir we are. Nearly Christmas, and not a carol in sight.